It's a movie moment to savor. When was the last time a filmmaker's sophomore release was greeted with such anticipation? It's as if Peele struck such a deep and rich vein in "Get Out" that no one can wait to see what else he'll uncover. Peele has found a new passageway into American psychology, and we're all waiting outside the mine for him to call out from the dark with his latest revelation. 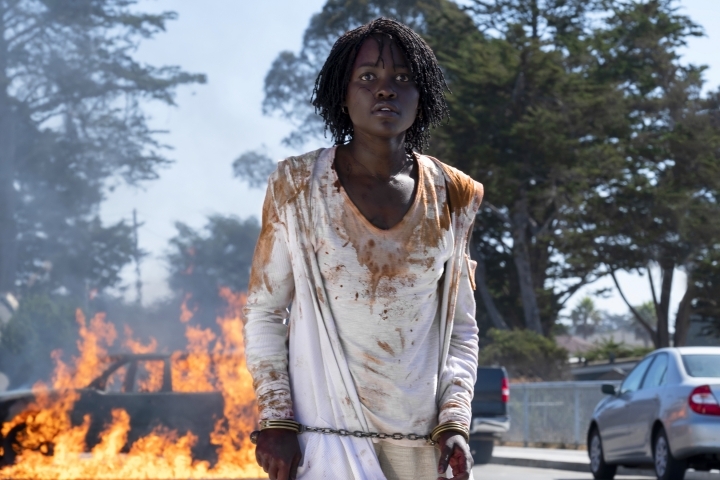 And in "Us," Peele has produced a terrifying artifact: a sinister ballet of doppelgangers and inversions that makes flesh the unseen underbelly lurking beneath every sunny American dream and behind every contented nuclear family. It's a scissor-sharp rebuke to anyone who's ever held hands and sang "Kumbaya." "Us" begins on images of one such moment of supposed unity: Hands Across America, that wholesome '80s experiment in linking arms across the country. It's seen on an old TV screen with VHS tapes of "Goonies" and "C.H.U.D." leaning against it. Later, when the Wilson family takes a vacation near Santa Cruz, California, they look out of their window at night and see the ominous silhouettes of a hand-holding family just like themselves outside on the driveway. 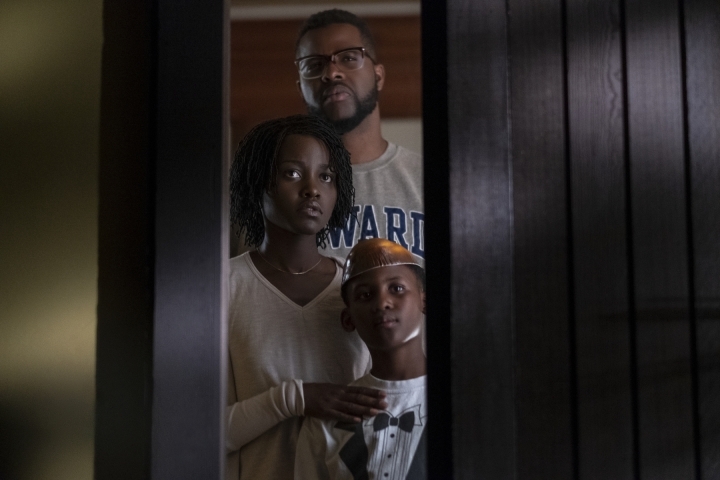 Their appearance is eerie to all: the mother Adelaide (Lupita Nyong'o), the father Gabe (Winston Duke) and their two kids, Zora (Shahadi Wright Joseph) and Jason (Evan Alex). But it's Adelaide who most immediately recognizes the danger. The Santa Cruz boardwalk is where she, as a young child, wandered into a carnival tent's hall of mirrors to find herself face-to-face with her exact double. That's the film's opening prologue before shifting to present day, and the scene, classically spooky, is perfectly realized by Peele. 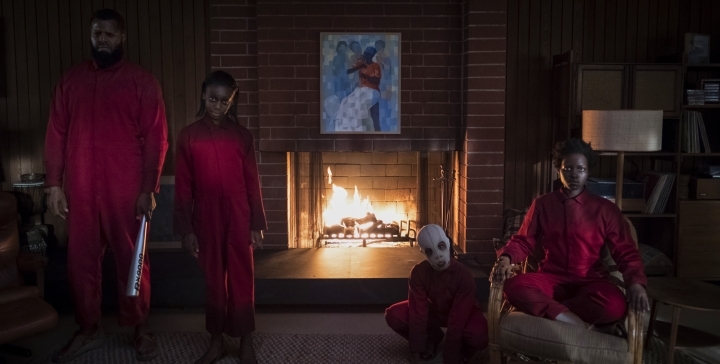 From the start, we feel Peele's increasing confidence as a filmmaker and, as Michael Abel's rhythmic, chanting score plays over the opening credits, we settle in for what we know, as soon as the Wilsons make their vacation plans, will be Adelaide's frightful reunion with her childhood mirror-image tormentor. It comes fast, like an assault. Soon after unpacking their bags and after a day at the beach with some friends (Elisabeth Moss and Tim Heidecker), the red-dressed doubles appear. Their arrival is harrowing and violent and "Us" quickly takes the shape, a little disappointingly, of a home invasion movie. A student of both genre and satire, Peele's genius lies in his ability to sustain both. But in "Us," he sometimes struggles to break free of genre tropes. The Wilsons' doppelgangers are a kind of sadistic, scissor-wielding echo of each family member. As "Us" bleeds into one ghastly scrape after another, we gradually grasp that they're part of a larger uprising of an underclass who are each horribly tethered to a surface-world human. Adelaide's double explains simply: "We're Americans." "Get Out" proved Peele a master of metaphor but "Us" works less on a purely symbolic level than on its own infinite-loop system of horror. Some questions get answered but others don't. The doubles arrive with only slightly more reasoning than the crows did in Alfred Hitchcock's "The Birds." Nightmares don't always need clarification. But I do think "Us" would work better if it gathered its suspense more steadily and more closely tethered its ideas to its characters. If the doppelgangers are stand-ins for an otherness that we fear in others but deny in ourselves, I'm not sure zombie-like maniacs were the most interesting way to go, or the most humanizing. And Peele's script, delving so relentlessly into terror, doesn't leave either side of the mirror room for much reflection. "It's all just craziness," someone says. Yet there's an undeniable power of "Us" as a deeper, more primal vision of a two-tiered truth in American society that's as unshakable as one's shadow. Peele, working with cinematographer Mike Gioulakis ("It Follows," ''Glass"), creates fever-dream images with passionate precision. And then there's Lupita. 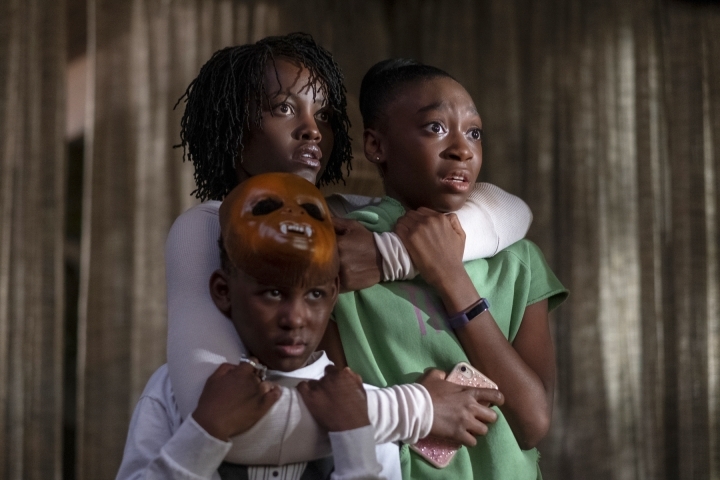 While each member of the family excels, Nyong'o delivers arguably her fiercest, most extraordinary performance as both Adelaide and her monstrous doppelganger. The wild difference between the two will get the most attention, but I was most impressed by the great subtlety of her Adelaide, a quiet, uneasy woman with a dark secret. 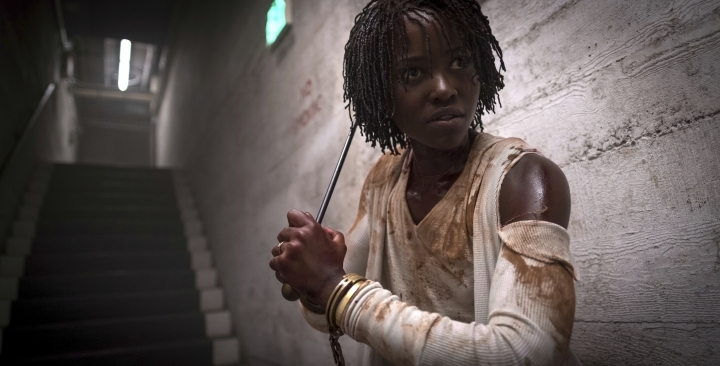 "Us" doesn't match "Get Out" but Peele will surely have more sunken places to investigate. And for that we should be thrilled. "Us" is rated R by the Motion Picture Association of America for violence, terror and language. Running time: 104 minutes. Three stars out of four.